This 42″ dia. 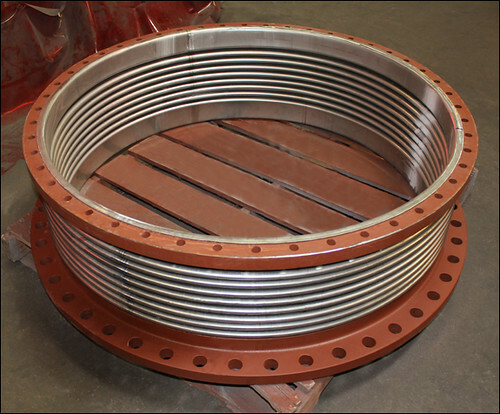 x 13-3/4″ OAL single expansion joint was refurbished for a chemical plant. The bellows were replaced with 304 stainless steel and the flanges were sand blasted and painted. The expansion joint was designed for a spring rate of 4,253 lb./in., 5/8″ axial movement at 222°F and 50 psig. A dye penetrant examination and air soap and bubble test was conducted prior to shipping.